Are you in the hunt for a wealthy dating partner or you are just interested in meeting a rich person. MillionaireMatch.com is consisting of millionaire singles such as professional models, Hollywood A-lister, CEO, lawyers, doctors, and engineers. They are one of the pioneers on millionaire dating, and they have successfully accumulated a community of high-quality members and created a service that offers a simple and fun experience of meeting a bunch of new people. This millionaire dating site has been in this industry for more than 15 years now. It has been featured in a lot of mainstream media like CNN, CBS and ABC and countless in publications such as Wall Street Journal. That is a testament that they are one of the best millionaire dating sites. Based on their latest released numbers, they have at least 2.3 million subscribers. It is just so easy to be a member of this site. You will have to provide essential information such as your e-mail address, gender, location, and age. You will also be required to provide your income information. To guarantee that all members are millionaire singles, each of the subscribers will undergo a strict verification system. They will submit documents proving that they are indeed a millionaire like documents that contains net asset of more than 1 million or tax return form. There are two types of membership on this millionaire dating site; the free and gold membership. With the free membership, the feature that you can use is pretty limited. You will not be able to initiate a conversation with other members, restricted in utilizing the advance search and you will not be verified as a millionaire. You will also not receive new and tips about the millionaire dating sites. With the Gold Membership, you can utilize the site in its full potential. Millionairematch.com encourages their members to write and share their blog. Another thing that creates a certain distinction from the other millionaire dating sites would be the fact that they allow their members to look at the photo at the “Member’s Luxuries” and “fashion Show” pages. They are also well-aware that their members have a pretty hectic schedule, so they make it a point to design their millionaire dating page suitable for people on the go. You can access their site through a mobile application. They are also offering an account manager for the Gold Members. You will be given a diamond logo as verification that you are indeed a member of the millionaire singles. 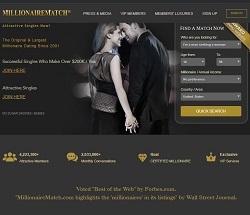 MillionaireMatch.com has consistently placed in the ranking of the top online dating sites. It is a great way to enjoy and find wealthy people who share the same level of aspiration in the corporate world. Their years in the business are a testimonial to the service that they provide to the millionaire singles.